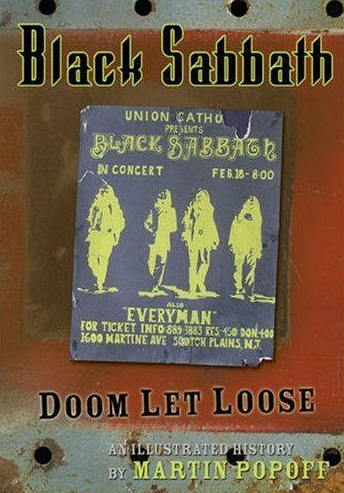 Black Sabbath: Doom Let Loose is the title of a new Black Sabbath biography by BW&BK Editor In Chief Martin Popoff. Published by ECW Press, the book is similar in format to Martin’s smash hit Rush biography, Contents Under Pressure, also published by ECW. “Containing rare and previously unpublished material culled from Popoff’s interviews over the last decade with all the principal members of the band, Black Sabbath: Doom Let Loose is an exhaustive song-by-song, album-by-album trek through the Sabs’ 37-year history. Numerous one-on-one conversations with Ozzy, Tony, Geezer, and Bill, as well as ten interviews with Ronnie James Dio, and additional interviews with supporting musicians such as Tony Martin, Ian Gillan, Glenn Hughes, Vinny Appice, and Neil Murray, make this full-colour retrospective a must for any fan. I’ve been a fan of Martin’s books for ages. The man has a knack of covering all the obscure bits that I personally am a fan of. So when Martin decided to tackle a book on Black Sabbath, you know I’d be interested in it. In short, this book differs from all the other “history of Black Sabbath” books by taking a different angle. It’s not just a straightforward “story”, it’s a recreation of the feel of the time. As I said before, he goes after all the periods of this band, it’s not just “The Ozzy Era”. The other eras are treated with equal respect, and that alone should qualify the book as a “must purchase”. It’s actually hard to put the distinction between Martin’s history and the other books on the history into perspective in just words. It’s one of those “feel” things. Another bonus is that he gets into the meaning of the songs, and not just “OK, such and such left the band, and they need a replacement”. You need to read the book.